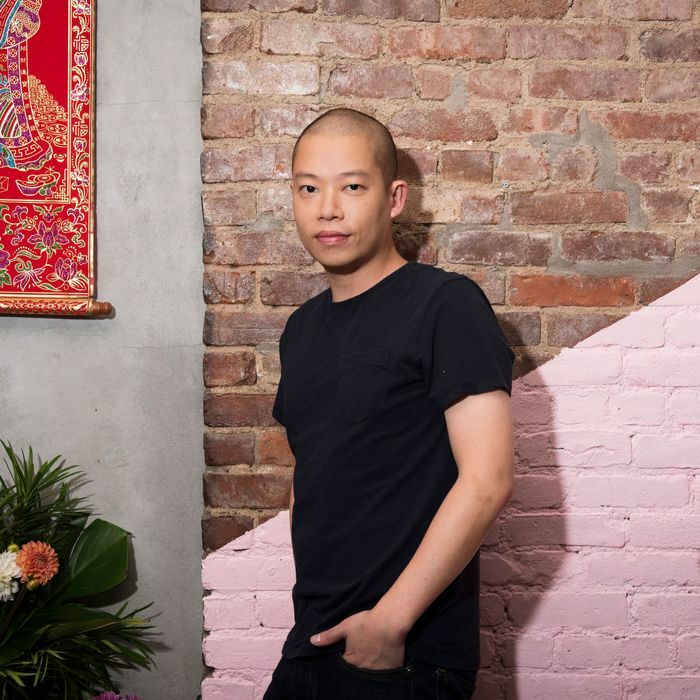 Michelle Obama first catapulted Jason Wu into fame in 2009, when she wore one of his gowns to the first inaugural ball (and then again in 2013). The designer has been a Vogue fixture ever since. He’s also an avid home-cook, and this week, he prepared a mix of high-low dishes that included black-truffle spaghetti and a classic burger. Plus, making the most out of summer, Wu visited Bellport for margaritas and homemade quesadillas. Read all about it in this week’s Grub Street Diet. For breakfast, I had the usual at the office: two hardboiled eggs, OJ, and iced coffee. Lunch was a salad with red quinoa, avocado, arugula, and sunflower seeds, with grilled salmon. I eat meals prepped by private chef Greg Karnilaw, who delivers lunches throughout the city. I barely even have time to stop during the day to eat, so I look forward to having a fresh, home-cooked meal in the middle of my hectic schedule. I love food, but I like it to be clean. I hosted a dinner at the Lucky Bee. The chef, Matty Bennett, made rare seared tuna, steamed fish with sesame and chili oil, coconut-braised short ribs, Khao Soi curry of chicken with egg noodles, and sour-orange Arctic-Char curry with lemongrass. When guests arrived, I was the bartender! Breakfast was egg whites, spinach, and a Swiss omelette with iced coffee. For lunch: Get Rich Quick sushi and Kelp Me! noodles from Juice Press. For dinner, my team joined me on my rooftop at home for a summer cookout. I thought it’d be more personal than going to a restaurant. I ate a huge burger. I also had lots of vegetables — like corn — and peach melba with vanilla ice cream. I love grilling fresh vegetables and keeping the ingredients pure. I season my burgers before I cook them with Worcestershire sauce, salt and pepper, and herbs, so they’re really flavorful. Growing up, my mom was always cooking. We’re close, so I was in the kitchen helping her, and I think it caught on. I went to boarding school during my teenage years, though, so it wasn’t until I moved to New York that I started to cook on my own, and it’s become something that I love to do. I’m really great at roasting chicken. I try to let whatever’s fresh at the market inspire my cooking — figs, asparagus. My cooking isn’t super studied or formula-driven. It’s funny: I literally buy everything, including clothes, online, with the exception of groceries. I have to see them myself. Once again, the usual: two hardboiled eggs, OJ, and iced coffee. Lunch was a Caesar salad with steamed shrimp and homemade croutons, made by Greg. Then, for a snack, I taste-tested shakes at Black Tap, working on a recipe for a minty shake I’m doing in honor of my GREY Jason Wu line. I had dinner at the Smile. I always get the spaghetti there. I like simple food, so a big bowl of pasta is the most comforting to me. And the chocolate-chip cookie with sea salt on top is a staple for me. I also love going to Via Carota and Sant Ambroeus, and I eat at Indochine every week. And this place China Blue in Tribeca — I think it’s some of the best Chinese food in the city. After such a crazy week, I slept past breakfast! My friend has a beautiful house in Bellport, so my husband and I went to his party, as his guests. It was a very relaxing weekend. By the pool, I had a fresh spinach salad with berries, a potato salad, and grilled salmon, with a glass of wine. I snacked on too many potato chips to count. For dinner, I ate too many homemade tacos, quesadillas, and a few margaritas in Bellport. I made the guacamole! I made brunch at home: Norwegian Eggs Benedict and a Bloody Mary. Brunch is fun for me to cook. I love anything with smoked salmon, a poached egg, avocado. Dinner was oven-roasted cod, tossed salad, and spaghetti in olive oil with black truffles, enjoyed at home with three of my best friends. I had never bought truffles before, and my friend brought them, knowing I’d like them. Another friend had just come back from Greece, and brought really great olive oil. What I did is toss the pasta with a little bit of brown butter and Parmesan, and then I shaved the truffles on top. It was beautiful. I feel like, with truffles, a simple preparation is the best. Not a lot of stuff! But I’ve got to get better at shaving the truffles — they didn’t come out as pretty as at the restaurants.